Radio Head | The Kids Beat | Kids VT - small people, big ideas! 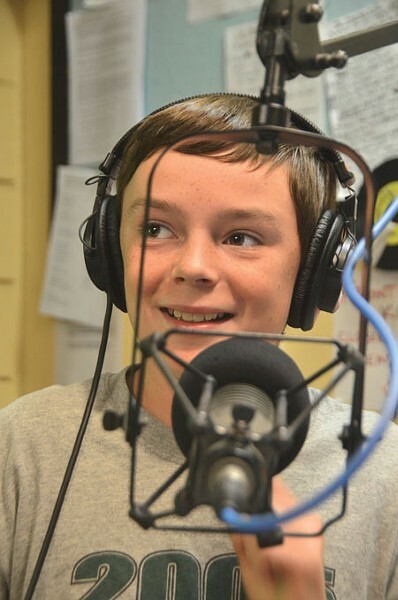 At noon on Tuesdays, when most kids his age are sitting down at a school cafeteria table, 13-year-old Tucker Odum of Montpelier is settling into the booth at WGDR for his live, call-in sports show, Tucker's Always Right. An avid sports fan, the seventh grader learned about the weekly gig at the community-based station from someone who knows his dad, John. He's homeschooled, so the midday slot wasn't a problem. After training to run the soundboard and passing the required test, Odum began broadcasting last winter. During one recent show he bantered with his dad, talked with callers about replacement NFL refs and shared his thoughts on the Red Sox outfield: Trade Daniel Nava, keep Will Middlebrooks. During the hour-long broadcast, he touched on most of the big sporting news of the week, but it was clear that baseball is his favorite pastime. His pick to win the World Series? The Cincinnati Reds. Stay tuned. Tucker's Always Right: Airs Tuesdays at noon on WGDR-WGDH, 91.1 FM and 91.7 FM.